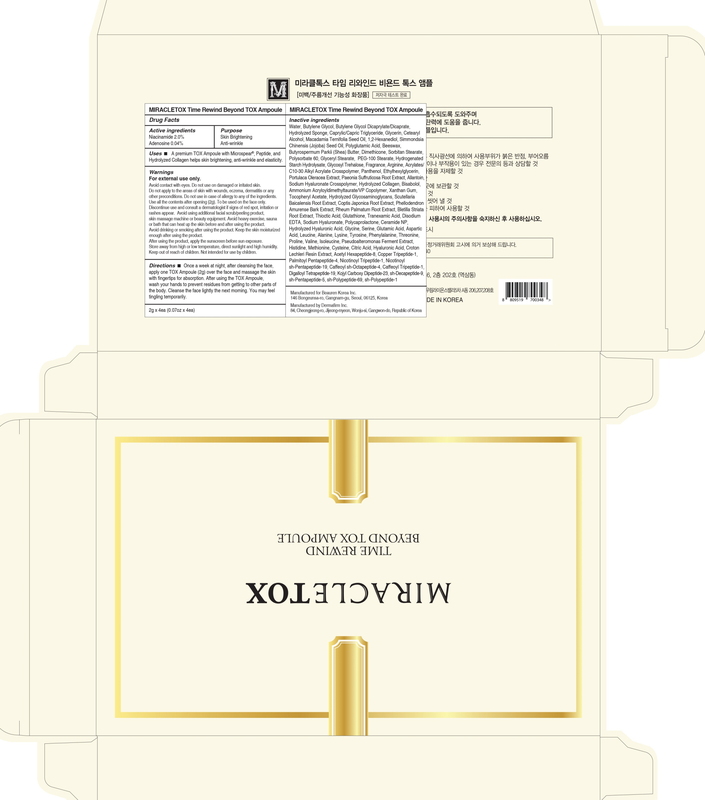 Proprietary Name: Miracletox Time Rewind Beyond Tox Ampoule What is the Proprietary Name? Miracletox Time Rewind Beyond Tox Ampoule with NDC 71619-250 is a a human over the counter drug product labeled by Beauren Korea Inc.. The generic name of Miracletox Time Rewind Beyond Tox Ampoule is niacinamide, adenosine. The product's dosage form is liquid and is administered via topical form. Warnings:For external use onlyAvoid contact with eyes.Do not use on damaged or irritated skin. Do not apply to the areas of skin with wounds, eczema, dermatitis or any other preconditions.Do not use in case of allergy to any of the ingredients. Use all the contents after opening (2g). To be used on the face only.Discontinue use and consult a dermatologist if signs of red spot, irritation or rashes appear.Avoid using additional facial scrub/peeling product, skin massage machine or beauty equipment. Avoid heavy exercise, sauna or bath that can heat up the skin before and after using the product. Avoid drinking or smoking after using the product. Keep the skin moisturized enough after using the product. After using the product, apply the sunscreen before sun exposure.Store away from high or low temperature, direct sunlight and high humidity.Keep out of reach of children. Not intended for use by children. Uses:■ A premium TOX Ampoule with Microspear, Peptide, and Hydrolyzed Collagen helps skin brightening, anti-wrinkle and elasticity. Directions:■ Once a week at night, after cleansing the face, apply one TOX Ampoule (2g) over the face and massage the skin with fingertips for absorption. After using the TOX Ampoule, wash your hands to prevent residues from getting to other parts of the body. Cleanse the face lightly the next morning. You may feel tingling temporarily.